For the Russian footballer, see Aleksei Nikolayevich Leonov. Alexei Arkhipovich Leonov (Russian: Алексе́й Архи́пович Лео́нов, IPA: [ɐlʲɪˈksʲej ɐˈrxʲipəvʲɪtɕ lʲɪˈonəf]; born 30 May 1934) is a retired Soviet/Russian cosmonaut, Air Force Major general, writer and artist. On 18 March 1965, he became the first human to conduct extravehicular activity (EVA), exiting the capsule during the Voskhod 2 mission for a 12-minute spacewalk. In July 1975, Leonov commanded the Soyuz capsule in the Soyuz-Apollo mission, which docked in space for two days with an American Apollo capsule. Leonov was born in Listvyanka, West Siberian Krai, Soviet Union. In 1936, his father Arkhip was arrested and declared an "enemy of the people". Leonov wrote in his autobiography: "He was not alone: many were being arrested. It was part of a conscientious drive by the authorities to eradicate anyone who showed too much independence or strength of character. These were the years of Stalin's purges. Many disappeared into remote gulags and were never seen again." In 1948 his family moved to Kaliningrad. In 1957 Leonov graduated from Chuguev military pilot's academy in the Ukrainian SSR. He was one of the 20 Soviet Air Force pilots selected to be part of the first cosmonaut group in 1960. Leonov was a member of the Communist Party of the Soviet Union (the only cosmonaut that was not was Konstantin Feoktistov). His walk in space was originally to have taken place on the Voskhod 1 mission, but this was cancelled, and the historic event happened on the Voskhod 2 flight instead. He was outside the spacecraft for 12 minutes and nine seconds on 18 March 1965, connected to the craft by a 5.35-metre (17.6 ft) tether. At the end of the spacewalk, Leonov's spacesuit had inflated in the vacuum of space to the point where he could not re-enter the airlock. He opened a valve to allow some of the suit's pressure to bleed off and was barely able to get back inside the capsule. Leonov had spent eighteen months undergoing intensive weightlessness training for the mission. As of March 2017, Leonov is the last survivor of the five cosmonauts in the Voskhod programme. In 1968, Leonov was selected to be commander of a circumlunar Soyuz 7K-L1 flight. This was cancelled because of delays in achieving a reliable circumlunar flight (only the later Zond 7 and Zond 8 members of the programme were successful) and the Apollo 8 mission had already achieved that step in the Space Race. He was also selected to be the first Soviet person to land on the Moon, aboard the LOK/N1 spacecraft. This project was also cancelled. (The design required a spacewalk between lunar vehicles, something that contributed to his selection.) Leonov was to have been commander of the 1971 Soyuz 11 mission to Salyut 1, the first manned space station, but his crew was replaced with the backup after one of the members, cosmonaut Valery Kubasov, was suspected to have contracted tuberculosis (the other member was Pyotr Kolodin). Leonov was to have commanded the next mission to Salyut 1, but this was scrapped after the deaths of the Soyuz 11 crew members, and the space station was lost. The next two Salyuts (actually the military Almaz station) were lost at launch or failed soon after, and Leonov's crew stood by. By the time Salyut 4 reached orbit, Leonov had been switched to a more prestigious project. Leonov's second trip into space was similarly significant: he commanded the Soviet half of the 1975 Apollo-Soyuz mission – Soyuz 19 – the first joint space mission between the Soviet Union and the United States. From 1976 to 1982, Leonov was the commander of the cosmonaut team ("Chief Cosmonaut") and deputy director of the Yuri Gagarin Cosmonaut Training Center, where he oversaw crew training. He also edited the cosmonaut newsletter Neptune. He retired in 1992. Leonov is an accomplished artist whose published books include albums of his artistic works and works he did in collaboration with his friend Andrei Sokolov. Leonov took coloured pencils and paper into space, where he sketched the Earth and drew portraits of the Apollo astronauts who flew with him during the Apollo–Soyuz Test Project. Arthur C. Clarke wrote in his notes to 2010: Odyssey Two that, after a 1968 screening of 2001: A Space Odyssey, Leonov pointed out to him that the alignment of the Moon, Earth, and Sun shown in the opening is essentially the same as that in Leonov's 1967 painting Near the Moon, although the painting's diagonal framing of the scene was not replicated in the film. 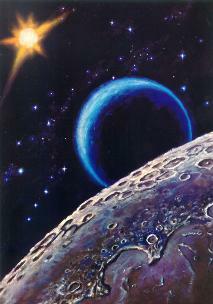 Clarke kept an autographed sketch of this painting—which Leonov made after the screening—hanging on his office wall. Together with Valentin Selivanov, Leonov wrote the script for the 1980 science fiction film The Orion Loop. In 2001, he was a vice president of Moscow-based Alfa-Bank and an adviser to the first deputy of the Board. In 2004, Leonov and former American astronaut David Scott began work on a dual biography/history of the Space Race between the United States and the Soviet Union. Titled Two Sides of the Moon: Our Story of the Cold War Space Race, it was published in 2006. Neil Armstrong and Tom Hanks both wrote introductions to the book. Leonov was also a contributor to the 2007 book Into That Silent Sea by Colin Burgess and Francis French, which describes his life and career in space exploration. Alexei Leonov on 1965 USSR 10 kopek stamp. Jubilee Medal "Twenty Years of Victory in the Great Patriotic War 1941-1945"
Jubilee Medal "40 Years of the Armed Forces of the USSR"
Jubilee Medal "50 Years of the Armed Forces of the USSR"
Jubilee Medal "60 Years of the Armed Forces of the USSR"
Jubilee Medal "70 Years of the Armed Forces of the USSR"
Medal "Veteran of the Armed Forces of the USSR"
Order "Golden Star" (Foundation Heroes of the Soviet Union and Heroes of the Russian Federation together with the organizing committee of the International Forum "The potential of the nation"). Order the "Pride of Russia" (Foundation for the "Pride of the Fatherland", 2007). National Award "To the glory of the Fatherland" in the "Glory to Russia" (International Academy of Social Sciences and International Academy of patronage, 2008). Leonov was awarded the Gold Space Medal from the Fédération Aéronautique Internationale (FAI) in 1976. FAI created an exception which allowed Stafford to be awarded it alongside him; typically the award is restricted to one person per year. Reward edged weapon — a nominal officer Dirk "Alexei Leonov"
Alexei Leonov (right) shares a moment with Anton Shkaplerov (left) in October 2011. A crater on the far side of the Moon was named after Leonov in 1970, near Mare Moscoviense (Sea of Moscow). Arthur C. Clarke's novel 2010: Odyssey Two was dedicated to Leonov and Andrei Sakharov; and the fictional spaceship in the book, the Cosmonaut Alexei Leonov, was named after him. Leonov wore a Russian Poljot "FMWF Strela" watch (a transliteration of СТРЕЛА, which actually means "Arrow") chronograph during his historic first space walk. 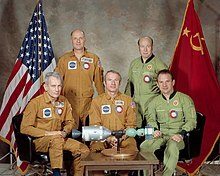 Leonov, along with Rusty Schweickart, Vitaly Sevastyanov, and Georgi Grechko established the Association of Space Explorers in 1984. Membership is open to all people who have flown in outer space. In the Star Trek novel Destiny: Gods of Night there is a ship named the U.S.S. Alexei Leonov, which is sacrificed to save the planet Korvat from the Borg. Leonov is featured as a character in the 2013 Doctor Who comic book story "Space Oddity", published by IDW Publishing. The film The Age of Pioneers (2017) is based on Leonov's account about the Voskhod-2 mission. Leonov was portrayed by Evgeny Mironov. The song "E.V.A" by Public Service Broadcasting on their 2015 album The Race for Space references Leonov becoming the first man to undertake Extra-Vehicular Activity in space. 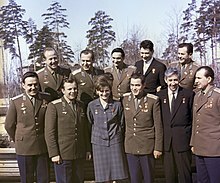 ^ The First Soviet Cosmonaut Team: Their Lives and Legacies. Springer Science & Business Media. 2009. pp. 55–56. ISBN 038784824X. ^ a b c d e Hall, Rex; Shayler, David; Vis, Bert (2005). Russia's Cosmonauts: Inside the Yuri Gagarin. Chichester, UK: Praxis. pp. 332–3. ISBN 0-387-21894-7. ^ McKinnon, Mika. "50 Years Ago, The First Spacewalk Nearly Ended In Tragedy". Gizmodo.com. Retrieved 28 January 2018. ^ a b "Alexei Leonov Biography". Astronautcentral.com. Retrieved 28 January 2018. ^ "Alexei Leonov: winner of the 2005 IAAA Lucien Rudaux Memorial Award". Archived from the original on 1 July 2007. Retrieved 2 July 2007. ^ Clarke, Arthur C. (1982). "Author's Note". 2010: Odyssey Two (1st ed.). New York: Ballantine Books. pp. xvii–xviii. ISBN 0-345-41397-0. OCLC 8429900. Clarke describes the painting itself on page 76 of the initial hardback edition. ^ "Aleksei Leonov and Alexander Gafin become members of the American Pushkin Academy of Art". Alfa-Bank. 23 February 2001. Retrieved 8 July 2007. ^ Sprekelmeyer, Linda, ed. (2006). These We Honor: The International Aerospace Hall of Fame. San Diego: Donning Co. Publishers. ISBN 978-1-57864-397-4. OCLC 71812756. ^ "Edwards Commander Awarded Medals". The Bakersfield Californian. Bakersfield, California. 1 October 1976. p. 9 – via Newspapers.com. Leonov, Alexey Arkhipovich; Sokolov, Andreĭ K (1967). Zhdite Nas, Zvezdy: The Stars Are Awaiting Us Ждите Нас, Звезды (National government publication) (in Russian and English). Мол. Гвардия (Mol. Gvardii︠a︡ )Moscow. Retrieved 19 October 2014. Text and captions in Russian and English; table of contents is in English. Scott, David; Alexei Leonov (2006). Two Sides of the Moon: Our Story of the Cold War Space Race. with Christine Toomey. St. Martin's Griffin. ISBN 0-312-30866-3. Rincon, Paul; Lachmann, Michael (13 October 2014). "The First Spacewalk How the first human to take steps in outer space nearly didn't return to Earth". BBC News. BBC News. Archived from the original on 15 October 2014. Retrieved 19 October 2014. A.I. Ostashev, Sergey Pavlovich Korolyov - The Genius of the 20th Century — 2010 M. of Public Educational Institution of Higher Professional Training MGUL ISBN 978-5-8135-0510-2. Wikimedia Commons has media related to Aleksei Leonov. Extravehicular activity (EVA) is any activity done by an astronaut or cosmonaut outside a spacecraft beyond the Earth's appreciable atmosphere. The term most commonly applies to a spacewalk made outside a craft orbiting Earth, but also has applied to lunar surface exploration performed by six pairs of American astronauts in the Apollo program from 1969 to 1972. On each of the last three of these missions, astronauts also performed deep-space EVAs on the return to Earth, to retrieve film canisters from the outside of the spacecraft. Astronauts also used EVA in 1973 to repair launch damage to Skylab, the United States' first space station. Pavel Ivanovich Belyayev, was a Soviet fighter pilot with extensive experience in piloting different types of aircraft. 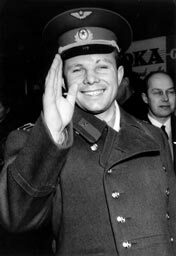 He was the first commander of the cosmonaut corps and the cosmonaut who commanded the historic Voskhod 2 mission which saw the first man walk in space in 1965. Georgy Timofeyevich Beregovoy was a Soviet cosmonaut who commanded the space mission Soyuz 3 in 1968. At the time of his flight, Beregovoy was 47 years of age: he was the earliest-born human to go to orbit, being born three months and three days earlier than the second earliest-born man in orbit – John Glenn, but later than X-15 pilot Joe Walker who made 2 suborbital space flights. Boris Valentinovich Volynov is a Soviet cosmonaut who flew two space missions of the Soyuz programme: Soyuz 5, and Soyuz 21. He was the first Jewish cosmonaut to enter space, preceding Judith Resnik in the United States. Valeri Nikolayevich Kubasov was a Soviet/Russian cosmonaut who flew on two missions in the Soyuz programme as a flight engineer: Soyuz 6 and Soyuz 19, and commanded Soyuz 36 in the Intercosmos programme. On 21 July 1975, the Soyuz 7K-TM module used for ASTP landed in Kazakhstan at 5:51 p.m. and Kubasov was the first to exit the craft. Kubasov performed the first welding experiments in space, along with Georgy Shonin. Vladislav Nikolayevich Volkov was a Soviet cosmonaut who flew on the Soyuz 7 and Soyuz 11 missions. The second mission terminated fatally. Vitaly Ivanovich Sevastyanov was a Soviet cosmonaut and an engineer who flew on the Soyuz 9 and Soyuz 18 missions. Soyuz 11 was the only manned mission to board the world's first space station, Salyut 1. The crew, Georgy Dobrovolsky, Vladislav Volkov, and Viktor Patsayev, arrived at the space station on 7 June 1971 and departed on 29 June. The mission ended in disaster when the crew capsule depressurized during preparations for reentry, killing the three-man crew. The three crew members of Soyuz 11 are the only humans known to have died in space. Oleg Grigoryevich Makarov was a Soviet cosmonaut. The Apollo–Soyuz Test Project (ASTP), conducted in July 1975, was the first joint U.S.–Soviet space flight, as a symbol of the policy of détente that the two superpowers were pursuing at the time. It involved the docking of an Apollo Command/Service Module and the Soviet Soyuz 19 capsule. The unnumbered Apollo vehicle was a surplus from the terminated Apollo program and the last one to fly. This mission ceremoniously marked the end of the Space Race that had begun in 1957 with the Sputnik launch. Georgy Mikhaylovich Grechko was a Soviet cosmonaut who flew on several space flights including Soyuz 17, Soyuz 26, and Soyuz T-14. Vladimir Aleksandrovich Dzhanibekov is a former cosmonaut who made five flights. Valery Victorovich Ryumin is a former Soviet cosmonaut. Anatoly Yakovlevich Solovyev is a retired Russian and Soviet cosmonaut and pilot. Solovyev holds the world record on the number of spacewalks performed (16), and accumulated time spent spacewalking. The Soviet space program comprised several of the rocket and space exploration programs conducted by the Soviet Union (USSR) from the 1930s until its collapse in 1991. Over its 60-year history, this primarily classified military program was responsible for a number of pioneering accomplishments in space flight, including the first intercontinental ballistic missile (R-7), first satellite, first animal in Earth orbit, first human in space and Earth orbit, first woman in space and Earth orbit, first spacewalk, first Moon impact, first image of the far side of the Moon and unmanned lunar soft landing, first space rover, first sample of lunar soil automatically extracted and brought to Earth, and first space station. Further notable records included the first interplanetary probes: Venera 1 and Mars 1 to fly by Venus and Mars, respectively, Venera 3 and Mars 2 to impact the respective planet surface, and Venera 7 and Mars 3 to make soft landings on these planets. Yastreb is a Russian space suit that was specially developed for early Soyuz space vehicle missions and for EVA. This model of space suit allowed the cosmonaut to spacewalk from the orbital module of Soyuz. Spaceflight began in the 20th century following theoretical and practical breakthroughs by Konstantin Tsiolkovsky and Robert H. Goddard. The Soviet Union took the lead in the post-war Space Race, launching the first satellite, the first man and the first woman into orbit. The United States caught up with, and then passed, their Soviet rivals during the mid-1960s, landing the first man on the Moon in 1969. In the same period, France, the United Kingdom, Japan and China were concurrently developing more limited launch capabilities. 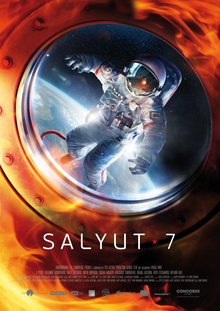 Salyut 7 is a 2017 Russian historical drama film directed by Klim Shipenko. The story is based on the Soyuz T-13 mission in 1985, part of the Soviet Salyut programme; it was the first time in history that a 'dead' space station was docked with, and brought back into service.